As with past FBI active shooter-related publications, this report does not encompass all gun-related situations. Rather, it focuses on a specific type of shooting situation. The FBI defines an active shooter as one or more individuals actively engaged in killing or attempting to kill people in a populated area. Implicit in this definition is the shooter’s use of one or more firearms. The active aspect of the definition inherently implies that both law enforcement personnel and citizens have the potential to affect the outcome of the event based upon their responses to the situation. 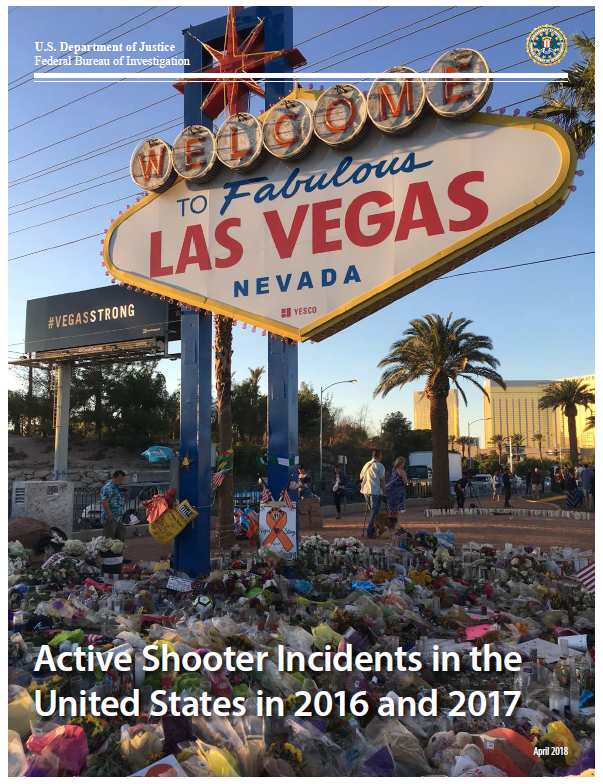 This report supplements two previous publications: A Study of Active Shooter Incidents in the United States Between 2000 and 20132 and Active Shooter Incidents in the United States in 2014 and 2015. The methodology articulated in the 2000-2013 study was applied to the 2016 and 2017 incidents to ensure consistency. Excluded from this report are gang- and drug-related shootings and gun-related incidents that appeared not to have put other people in peril (e.g., the accidental discharge of a firearm in a bar). Analysts relied on official law enforcement investigative reports (when available), FBI holdings, and publicly available resources when gathering data for this report. The 50 active shooter incidents occurred in 21 states. Six incidents occurred in Texas. Five incidents occurred in each of the following states: California and Florida. Four incidents occurred in Ohio. Three incidents occurred in each of the following states: Maryland and Washington. Two incidents occurred in each of the following states: Colorado, Kansas, Nevada, New Mexico,New York, Pennsylvania, Tennessee, Virginia, and Wisconsin. 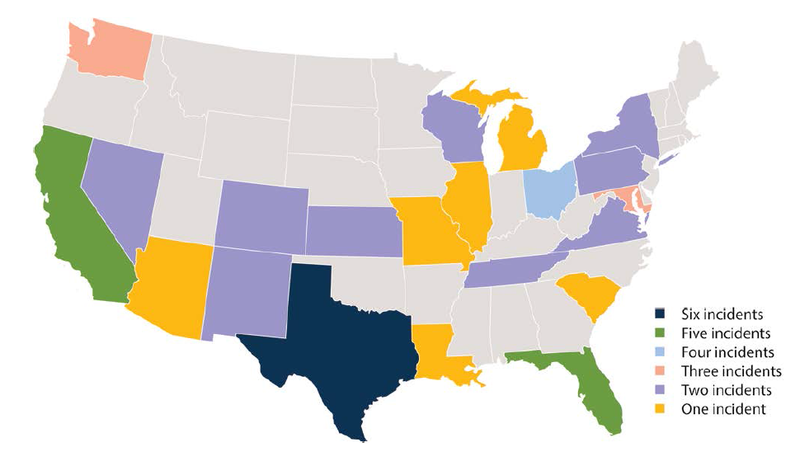 One incident occurred in each of the following states: Arizona, Illinois, Louisiana, Michigan,Missouri, and South Carolina. The 50 incidents resulted in 943 casualties (221 people killed and 722 people wounded, excluding the shooters). The highest number of casualties (58 killed and 489 wounded) occurred during the Route 91 Harvest Festival in Las Vegas, Nevada, in 2017. The second highest number of casualties (49 killed and 53 wounded) occurred at Pulse, a nightclub in Orlando, Florida, in 2016. The third highest number of casualties (26 killed and 20 wounded) occurred at the First Baptist Church in Sutherland Springs, Texas, in 2017. Law enforcement officers exchanged gunfire with the shooter at the scene of 14 incidents. They sustained casualties in eight of those incidents. A total of 33 law enforcement officers were killed or wounded in 12 incidents. Of note, 14 of the 33 casualties occurred in a single incident (five law enforcement officers were killed and nine were wounded as a protest in Dallas, Texas, was winding down). Thirteen law enforcement officers were killed in six incidents. Three law enforcement officers were killed while engaging the shooter to end the threat. Two of thethree law enforcement officers7 were killed by the shooter. One plainclothes law enforcement officerwas killed by friendly fire. Six law enforcement officers were ambushed. Two off-duty law enforcement officers were among the 58 event attendees killed by the shooter. Twenty law enforcement officers were wounded in eight incidents. Thirteen law enforcement officers were wounded while engaging the shooter to end the threat. Four law enforcement officers were ambushed. Security personnel confronted the shooter at the scene of two incidents. One security guard was wounded. Two armed, non-sworn security personnel in one incident exchanged gunfire with the shootercausing the shooter to flee the scene.15 He was arrested a short time later at another location. One unarmed security guard was wounded as he struggled with the shooter.16 The security guard wasable to flee and alert an off-duty law enforcement officer working nearby. The shooter committedsuicide at the scene as additional law enforcement officers arrived.